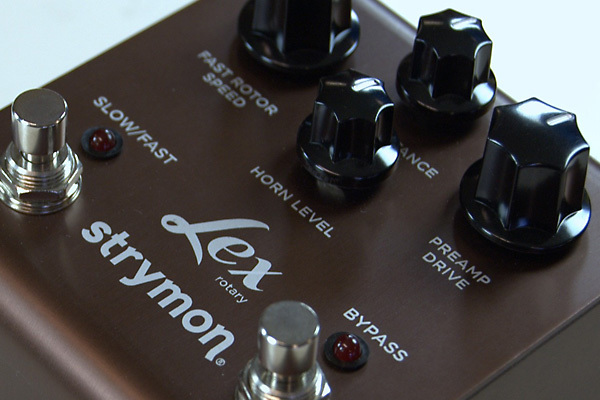 Iâ€™ve had a lot of requests for the Strymon Lex Rotary lately. This rotary speaker simulator seems to have caused a lot of stir and not least among Gilmour enthusiasts. I recently got my hands on one and hereâ€™s my review. Rotating speaker cabs has been Davidâ€™s secret weapon since 1971-72. His stage setup at this point featured the classic 3-head Hiwatt rack, WEM speaker cabs and a Leslie 147. The Leslie was swapped with two Yamaha RA200 cabinets in 1976-1983 and the jaw breaking 1994 stage setup featured custom designed Doppola rotating speakers. Read more about Davidâ€™s rotary setups here. While Clapton, Vaughan, Harrison etc used Leslies as a main effect, David would blend or mix the effect with the main amps. This subtle liquidy swirl is the essence of many of his classic tones throughout the years. The newly released recording of Dark Side of the Moon from Empire Pool, Wembley 1974 is a great example of how the Leslie 147 cabs adds a huge dimension to his tones. You could easily use a chorus or flanger to create something similar but itâ€™ll never be quite the same. The Lex Rotary was designed with a painstaking focus on details and the complexity of a rotary cab and look no further people â€“ this is as close as youâ€™ll get to fit a Leslie in a box! The Lex is housed in a slightly bigger TRex sized sturdy box with easy to reach big knobs. There are four controls allowing you to adjust the fast rotor speed, mic distance at the horn, horn level and preamp drive (quite decent but I recommend a better sounding overdrive pedal). There are also two on/off stomp switches for slow/fast and bypass. The pedal runs on 9V Boss style adaptor and feature true bypass switching. This is only the beginning though. The Lex also has a number of â€œhiddenâ€ controls thatâ€™s engaged by stomping both foot switches simultaneously. The four controls then allows you to make additional settings like different mic placements, volume boost etc. There are so much technical specifications that I wonâ€™t even dare to begin describing them. Fear not though â€“ the Lex is super easy to operate. Check out the Strymon site for more details and soundclips. No I haven’t become bald… I haven’t done any clips for this review simply because I can’t do it any better than this excellent demonstration. Please check out the clip and see the Strymon web site for more details, sound and YouTube clips. Iâ€™ve tested the Lex both in mono and stereo. You can place it among your pedals like any other chorus or flanger and get a very dynamic chorusy tone with that classic tremolo swirl. However, if you need to run the pedal in mono I strongly suggest that you split the signal and place the Lex on one line with a second amp. This way you get a setup similar to Davidâ€™s and you can adjust the level on the assigned amp for the desired amount of Leslie effect. See this feature for more on replicating Davidâ€™s rotary setup. The Lex should be operated in stereo though. The tone can fool even the most devoted Leslie fans and I had a hard time telling it apart from a Leslie 760 that I compared it with. Standing in front of the stereo setup you can hear how incredibly dynamic and sophisticated the Lex is. A Leslie or rotating speaker isnâ€™t just a static effect like your average distortion but there are all these nuances that makes up the tone. A pedal alone canâ€™t replicate the acoustics and dynamics of your studio or a stage but the guys at Strymon seems to have cracked the code and delivered a pedal thatâ€™s almost as organic and alive as a real Leslie. So how does it compare to other rotary sims? The Lex is very similar to the old Korg G4 and HK Rotosphere. The Lex however sounds more natural and organic and the ramp to slow/fast is much smoother. The Line 6 Rotary Machine does a nice job but sounds almost like a ring modulator at high speeds. The Lex stays focused and allows you to carefully place the mic just where you want it for the right swirl. I use the Boss RT20 a lot but it doesnâ€™t really sound anything other than a very sophisticated chorus and thatâ€™s pretty much why I like it. In my opinion you canâ€™t really compare the two but the RT20 has one huge advantage, which is the mix effect control. This is a slight draw back on the Lex especially in terms of Davidâ€™s tones. The reason is that you donâ€™t really want a dominating rotary effect but rather a mild swirl. Not quite a chorus and certainly no flanger but just a hint of that certain something. The Lex works very well for cleans and mild overdrives but gets all too dominating and dark when you try to run a Big Muff through it. In this case youâ€™re better off with a Boss RT20 or simply a chorus. But, the Lex was never made with Gilmour in mind. Judging by the Strymon website they set out to create the most authentic sounding rotary simulator and in my humble opinion I think theyâ€™ve done it. Highly recommended! Bjorn, thanks for the wonderful reviews! Much less learning about DGs tone, I’ve learned about sound, effects, and musicality while going through your content! About the lex, I’m wondering if you know of a way to utilize the stereo output, which as you say is really the Jewell of the pedal, but also add in a blender? Is there some kind of stand alone blender that accepts stereo inputs, adds in the lex, then sends out blended stereo outputs? I have a Boss ES8 switcher which I think I can do this through using one of the stereo loops, but that means taking up a loop and making me have to juggle more pedals through the remaing 7. It would be nice if the was some stand alone unit that could do this with the stereo signal coming out of the ES8. Good question, I haven’t done any research on that really… Anyone? A somewhat expensive solution, so don’t get it just for the lex, but I have a Boss Es 8 switcher on the way. 2 of the eight controlled channels are in stereo (overall output in stereo too), so you can access that necessary element of the Lex with two amps, but the Es 8 also allows you to blend that signal into the overall chain. Hi Bjorn. I have a lex, if I was to use a blender pedal with it so I can control wet/dry would it be a better option than the rt-20. A blender would solve the lack of a master volume but personally I do prefer the RT20 for David’s rotary tones. That is, the Lex is great for the 1972-75 stuff but the RT20 is better for Animals, Wall and PULSE. The reason for that is that the Yamaha and Doppola cabs that David used in the latter period, has a more chorusy tone and the Lex has much more of that Leslie tremolo. It doesn’t quite cut the modulated Muff tones. Bjorn: Have you ever tried/tested the Ibanez RC-99 Rotary Chorus? It’s an old purple big-box pedal similar format to the AD-99 analog delay. It’s subtle and much less noisy than the RT-20 (I have that too…too processed-sounding for me). Any thoughts experience with the Rotary Chorus? Wow…Even if this is 50% of a real Leslie, I can’t imagine how would someone feel playing one. I got one a few hours ago…I am thrilled, really! What settings do you prefer? Surely depends on how you use it, Single-amp setup, or Double-amp setup, Mono or Stereo. I tend to like the close mic, makes the swirl more present, with the horn level a hair below 50%. I haven’t tried the cab direction yet, though. I desperately needed a modulation pedal for a band contest I participate. It was a hard decision, but your last video, Any Colour jam, was crucial to decide, what pedal between a UniVibe and Lex to get first! I am sure it’ll add that little extra magic! I really owe you so much, of how I perceive and understand music. Thanks for your kind words! I’m usually keeping the fast rotor at 10:00, mic 11:00, horn 2:00 and drive around 10:00 but it depends on whether I’m using a gain pedal with it and how much headroom the amp I’m using with it has. All the second function settings are factory. Still amazes me what this pedal is capable of! After using it in stereo, I tried it on a double setup on a Vox AC15 to complement my main amp in this cover, hope you like it! 1. What kind of amp do you like to use it with better? Brighter ones, Vox and Fender style, or darker and more compressed like Marshalls? Does it make any difference? I was thinking of small 1×12″ speaker amps (Cub 15, Lionheart5, Deluxe Reverb) and ultimately two of them to use the Lex in stereo, next to my main amp. 2. How do you prefer to record Leslie’d amps? Just use your trusted SM57 as with other tones? Hi Dimitris! Sorry for my late reply. Thanks for sharing the clip! I use different amps for different sounds, I guess. The Lex sounds great on all amps. I don’t own a Leslie myself so I let our tech or producer set it up for me, whenever I record one. You got to be careful with the wind caused by the rotor and find a nice balance between the low speaker and rotor. I record it like any other pedal. The amp fairly neutral and the mic slightly off centre, angled just a tad, and about 10cm off the grille. Should I get this or a vibe pedal? Which one do you think can help me get more Gilmour tones? Depends on what tones you’re looking for. The Lex is a Leslie rotary simulator and should not be mistaken for a UniVibe, which is a phaser. You can’t use a rotary sim to replicate David’s UniVibe tones on Breathe or his phaser tones on Have a Cigar. However, David often use rotary cabinets in addition to his Hiwatts or Fenders for a slight modulated tone. The Lex, not having a master effect control, is not that suited for that purpose but it’s probably one of the best sounding Leslie pedals out there. I would would look into a UniVibe, like the Electronic Orange MoonVibe or the Machine Vibe from DryBell. Would The Dry Bell’s “Vibe Maccine” be a similar sounding alternative to the Boss RT-20? I mean for solos like ” What do you wants from me”, would you still get the same sound by replacing you RT-20 with the Vibe Machine? As I said before I really want to get that gorgeous liquidy/swirly sound of David’s “What do you want from me” and I think you nailed it by using your RT-20 in your sound sample in your website, but if you used the Vibe Machine instead of the RT-20 would you sound the same? I would rather buy the Vibe Machine instead which is a lot smaller. No. The Vibe Machine is a UniVibe or phaser, with a dark “swooshing” tone. The RT20 is basically a chorus, made to sound like a rotary cab. They’re very different sounding. The closest the to RT20 would be a chorus of some sort and perhaps some of the more modern sounding, like the Boss CE5 or the MXR Analog Chorus. I just bought the Lex a week ago, and I needed to share my experience. It’s a must have for high-end gilmourish tone chasing. I play with a dry/wet setup. All the pedalboard goes through the main Hiwatt 200 (a bass amp with Wem cab and linked channels), and I use a Lehle PSplit to send the same signal to the Strymon Lex in mono to the Small Hiwatt (T20). I could use a third amp to use the Lex in stereo, but it’s already tasty in mono. From what I’ve read in Bjorn’s articles on rotative speakers, Gilmour is using some kind of the same setup. Well, the Hiwatt T20 fed with the Lex alone is quite good, but I was expecting a bit more headroom. In fact for this kind of high-end gear I was almost disappointed by the wet amp overall sound, and since the knobs course is very gradual and not very responsive, you cannot have overkill rotation like a tremolo for instance (but there other pedals for that). For the price, I had the right to expect some kind of Gilmour-in-a-box pedal, and I didn’t felt it blended to much with fuzz or distortion. But in mono with only one amp, the sound is still quite convincing and there are plenty of nice options like the speaker acceleration or deceleration. Following Bjorn’s guide, I used another amp with a dry signal, only without the Lex added. It makes a totally different sound. Suddenly your signal is ten times more open, transformed to something much more vintage. Great review as usual, many thanks. I am really looking for a pedal for David’s swirly sound in his solos, especially “What do you want from me”, “Raise my rent”. I think I hear this swirly sound more or less in ALL of David’s solos and really love it. The video reviews/demonstrations for rotary stimulators are mainly done without any overdrive or distortion involved and show some chords and arpeggios with clean tones. There aren’t any demonstrations of these pedals showing how they sound when soloing using the rotary pedals together with sweet sustains and delay and overdrive pedals like for example “What do you want from me”, or the Time solo in “pulse”. Which one of these rotary simulators do you recommend for those solos? I had a Boss RT-20 a while ago that I have sold as I couldn’t get what I wanted with it. Now I’ve got a tiny rotary speaker pedal called Hotone Roto, which is OK but not great. Also I thought that the boss RT-20 was quite large and bulky. I’ve had a look at the best available rotary pedals and I’m very interested in the “Neo Mini Vent” and the “Strymon Lex”. They sound awesome in the video reviews and are a bit smaller too. Could you please let me know what you think and what you recommend for me? As I said before I would be using them only to get a sound like the solo in “What do you want from me”. 1- Have you tried the “Neo Mini Vent”? Is it as good as the Boss RT-20? 2- what are your settings on the RT-20 for David’s solos? The Neo is similar to the Strymon Lex. Both does a very convincing Leslie rotary simulation. The RT20 is a pretty mediocre simulation and rather more like a very deep chorus. But, it works great for David’s tones as he’s blending his rotary cabs with his other amps. A Lex or Neo wouldn’t apply as nicely. I’m mostly using these settings, with the RT20 placed last in he chain: Mode 1, rise time 12:00, effect 9:00, direct 11:00, balance 11:00, overdrive off, slow 2:00. I traded my due to it’s complexity, but here is a link that may help. I’m writing this so that Forrest, who seems to dislike me leaving the A out of Vaughan, won’t make anyone think I lied about it. It may be found on Google, although if not, I’m sure that the intelligent Forrest will find out somehow, The T-Birds opened for J.Geils at the Richmond Mosque, now known as the Landmark Theatre. I worked as head of hospitality for the show. The date is simple to find, but with some digging, you might find that the T-Birds Manager for a portion of that tour, was a heavy whiskey drinker named Herb, who introduced me to Jerry Geils. I was so young, and dumb, I asked Geils,” should I call you Jerry, or do you prefer Mr. Geils?”, which made everyone crack up, ( except me of course). The date was February 4, 1982. I’ve never asked for an autograph in my life, so my only proof, is my word. I did have photos, and many badges, but they were all lost in the early ’90’s, along with everything I owned. I hate this kind of BS, where someone for no apparent reason picks a minute detail out to specifically get to me. Well, obviously it bugged me, I shouldn’t have even responded, but I think I get on well with most on this forum, and want to dispel any thoughts,; that I would be as petty as, the person calling themselve Forrest. What would I gain by making: up such a tale to people I’ll likely never meet? Zero! I’m almost 53, and will be a grandfather in March. That’s a bigger story than the multitude of Rock, and Blues stars: I’ve met in my life. I did a lot of road work, and open Ed for a lot of big bands, so what!!! I was merely saying that I met him several times, that he was nice, and he used a Leslie the first time I saw, and met him at MUCH MORE, if any other Richmonders are on here, and remember the club. That’s all folks! And just a quick addition to my last post. Stevie Ray Vaughn, and his equally, incredibly, talented brother were the most down to earth Rock stars I’ve known, Stevie never forgot my name, or acted like he was special. He treated me like a good old friend whenever I was with him, and akways a gentleman, and very funny. His brother was the same kind of good ol’ Texas boy made good. I miss Stevie greatly! I knew SRV, and Jimmie better, before anyone ever heard of Stevie, the Fabulous Thuderbirds played at my local neighborhood bar at least a couple of times a month, and I crewed for them after their first hit, when they opened for J. Geils when they reemerged, at a 4000 seat venue. Now that I’ve established that, fact is, before he got famous with “Sweet Little Thang”, I met him at a local venue he played, standing drop jawed next to Lindy Fralin. Had his brother not told me I needed to go, I would never have known the greatest blues rock guitarist ever born. I can’t say what he had on stage when I saw him in 10-25,000 seaters, but that first show, he had a Lesile 147, the nice old wooden model that every b3 player used. So, I know that he indeed used a Leslie early in his career live. You mentioned Vaughan used a Leslie as a main effect. Actually SRV used a Vibratone cab as an extension speaker with his Vibroverb. I have also read he used his Dumble SSS into the Vibratone. The Vibratone was then miked to mix it in with his blistering volume. So SRV was using a Vibratone in a similar way to how you describe Gilmore using the rotating speaker effect. SRV always used several amps. As far as I know there was only ever a single Vibratone cab. I’ve never heard an SRV song with an overwhelming rotating speaker effect. It sounds like more of a blended in effect. Hello once again, I’m curious, when recording do you use the Lex, or one of the many supposedly great Leslie plugins? I haven’t tried any with guitar yet, but the leslie effect in the YC3b Yamaha b3 VST sounds dead on a 147?, and though that particular Leslie is part of the YC3b, it definitely shows how close to a real Leslie these plugins can get, dirt and all, even loose belt settings for the slower transition from slow, to fast that is yet another accident turned into a great effect, now referred to as ramping up, and down. Do you think using the One Control pedal with the Lex is the best way to get DGs blended leslie sound, or can you do just as well using the controls on the Lex such as Mic placement? Do you still feel your RT20 is best at capturing that subtle blended sound? I currently play an Ampeg VT40 with a “Cordovox Leslie,” and the “slow” speed 10″ leslie cabinet mixed with the four 10″ Ampeg speakers is my “default” tone. With the speed on slow, and being mixed with another amp, you almost can’t detect an “effect” on the tone. But it just produces this wonderul, lush, subtle chorus effect that rounds out the sound and slightly compresses it. As much as I love this rig, it is impractical to lug this stuff around. The vt40 alone is a behemoth, and should not be a combo amp! In fact, I am caving cabinets made to break it into a head and four ten cab. I want to get a rotary sim pedal and use it in just the same way to always affect my tone, just slightly. For a long time, I thought I would get closest to this “blend” by using a pedal like the Lex, and a “blend” pedal. But lately I’ve been reading that digital effects cause phasing issued when put in a parallel effects loop (essentially what the blend pedal is). Do you have any experience with this? I’m hoping the Lex or the mini vent will play nicely with a blender pedal so I can try to simulate my “blended” rig a la DG. Best option for mono, IMHO is to use a good blender loop pedal. simple! Hi. Bjorn. These “rotary effects” aren’t very similar to a “DryBell Vibe Machine” with the chorus mode activated (and maybe a flanger connected in chain)? Regards! the srv 212 and 112 sound great I have both and with the right amp they add that lush thickness that as close as pedals come, don’t quite capture. Great site! One of the web’s better repositories of Tone knowledge. It does seem there’s some misunderstanding as to the existence of a level/blend function on the Lex; using the Mic Placement, Horn Level, and Boost/Cut functions make it possible to sit a mono signal in the mix quite well for Gilmour’s milder rotating-cab tones, in my experience. The Lex is a pedal that I don’t think I could play without anymore. . .after the first gig I used it, one of the “tone snobs” that haunt the venues here asked me what mics I was using on the Leslie. . .he was SO sure we had a Leslie hiding in the backline. His pride was noticably wounded after I explained that it was a Lex. Anyway, great site, keep up the fantastic research! Nice one, sir! Any chance you will review more of those Strymon-Tools? I bought a Mobius recently and honestly: I can’t believe how incredibly good it sounds! I play guitar for about 20 years and had lots of gear, some of it absolutely top notch stuff. But Mobius completely floored me… just a matter of money until i’ll buy a Timeline as well. Would love to hear your thoughts on those devices with the special perspective of Gilmour-related sounds and your experience! I have a Strymon Lex and I want/need to blend it. I bought a Saturn Pedalworks Blender/Loop and for some reason it does not play well with my Lex. The blend function works but the volume comes thru about 50% of what it should be. I am seriously considering purchasing the One Control Mosquite Blender. Have you used this blender with the Lex specifically? and it works well? If so please let me know and I would feel comfortable pulling the trigger after your confirming that. Hey Bjorn, would the above mentioned wet/dry pedal work for my two amp and Rotary set up we’ve discussed? No need to post, unless you think it will help others! Have you tried the “One Control Mosquite Blender” wet/dry mix pedal? I’ll order one, hopefully it will be transparent with respect to tone. I’ll try putting only the rotary pedal in the wet loop and so how the mix sounds. Maybe ~25% wet and ~75% dry. In April Hammond is releasing a Leslie pedal with 122 and 147 modeling. Of course you need to review this one too! Thanks for all the great reviews and wonderful site. Bjorn, you MUST listen to this! Even if you don’t care about the pedal. I’m on the verge of crying. I have one here great pedal even mono its quite convincing .. Question how can I run this pedal with amps that require buffered efx loops ? Just got that “last pedal’ yesterday! And wouldn’t you know it was the RT-20! I asked Bjorn,he answered, I purchased. It’s become a pretty simple process for me as far as pedals go. I told Bjorn what I wanted to do, gave him my options, he gave me his opinion, I took his advice, and I have yet to be disappointed! Thank you Bjorn, I not only can somewhat emulate David’s playing, but through you, have definitely got the tones down pat! The Lex is great but I also found that the lack of mix is a pain to achieve subtle effect. Also I found it a little arsch with overdrive. I want to try the Dls Rotosim… Stereo input/output and a Mix control! Supposed to nail that subtle Gilmour tone! I had to decide: HK Rotosphere, Boss RT20 or the new Lex and my main concern was that I’d play it in mono, mostly with a soft, mild overdrive (Colorsound power boost or BK Butler Tube Driver, depending on the song). Now, after reading your article and the comments from Glenn and Guido, I’ve finally made up my mind: Boss RT20. Big, big, big thanks from Barcelona! I have both the RT20 and the Lex. While I am still in the honeymoon phase with the Lex I love it. The RT20 is a very good and enjoyable pedal and has its own place in many sounds and I will still be using it. That said, I find the Lex so responsive to tweaking and so natural sounding (and note – so far only in mono). So much so that it has made me realize that so many of the phase, chorus and flange type sounds on classic tunes I love were actually rotary speakers. It takes a good effect to do that! My first Strymon pedal and I am impressed. This pedal sounds great! I must ask, have you tried out their Timeline delay? Regardless of the answer, would you recommend it for Gilmour type tones? I’ve played the Dark Side with my band Pink Project last Saturday. Inspired by the 74 live version we have improvised on Any Colour where I used the Strymon Lex Rotary for. I have put it on you tube especially for this review. Recorded it with the Zoom Q3. The videoquality is bad due to wrong settings but the audio is pretty good- IÂ´ve played stereo on two hiwatts with my Gilmour relic strat, TC Nova, Smallstone Nano through the Strymon. I knew it would be a matter of time before you did a review on the Lex. I’m still waiting to hear one in person, but impressed with the level of detail Strymon put into it. I have an H&K Rotosphere, & love it. I use it for the synth side of my synth-guitar rig, & a Line 6 M13 for the guitar side when we’re performing our DSOTM set. While checking out all the forums looking for people’s thoughts on the lex, one sentence was common in most: “Nothing beats a real Leslie…(but the Lex comes close)”. This has given me a new obsession to build a few true rotating speaker type cabinets to use live, at least until I can get my hands on a Lex. Always appreciate your reviews & articles! Cheers! Great review…I’ve been very interested in the Strymon line, particularly this pedal. 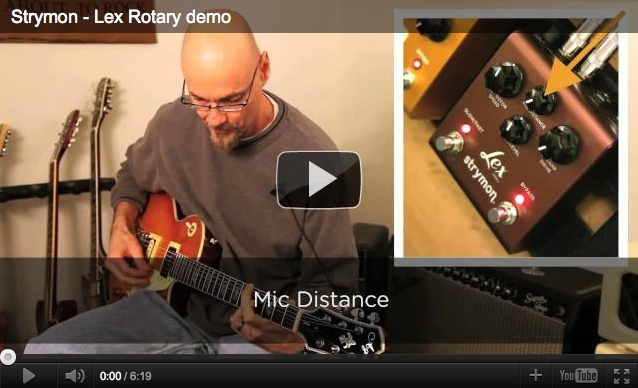 Great review Bjorn, I’m always interested in rotary speaker sims. Just wondering have you heard of the Motion Sound rotary speakers I’m checking them out and wanted to know if you heard of them or tried them out? Hello Bjorn, nice review as usual! That was a great review Bjorn, I always look forward to one of your reviews. Just wondering have you heard of the Motion Sound rotary speakers, more specifically the SRV-212 & SRV-112, I’m at the moment checking them out. I was just wanting to know if you heard of them and what you think about them. One other thing since I found this site, just a little over a year ago, is that I come here regularly to check what’s new. Just saying that this is a great site. I have the Strymon Lex rotary and it’s really perfect for the Darkside tones. Breathe, Us and them! and with one click you will get an awesome Any Colour you like swirl. I recognize Bjorn’s opinion that it’s to dominant for solo’s like Numb but it’s very usefull for the Dogs solo’s and Pig’s chords Em/D C/Bes. Great pedal! Nice pedal, and a LOVELY sound! However, its yet another pedal that costs a fortune. Sadly not many of us can afford Â£250 (UK money) pedals. You said that the pedal will be better on stereo… The pedal have an left and right output… left to your main amp and right to the other one? Or… use the pedal apart in a stereo amp? Amazing sound in Lisbon last month! Very full and organic! Great Review!!!.. One trick that you can use with this pedal is to use a parallel loop pedal and place the LEx (or other rotary fx) there. If you place a volume pedal after the rotary and set the mix of the loop at 50% you can use the volume pedal to mix the wet signal with the direct and in this way it gets more “gilmourish”. I used this method with the loop of my amp and the RT20 (direct level at 0) and worked great! nice pedal….did you compare it with the line 6 m9? IÂ´ve heard it got pretty good leslie sim!! !